Check out schedule and descriptions below for more info. Prepare to be AMAZED by what YOU can do! 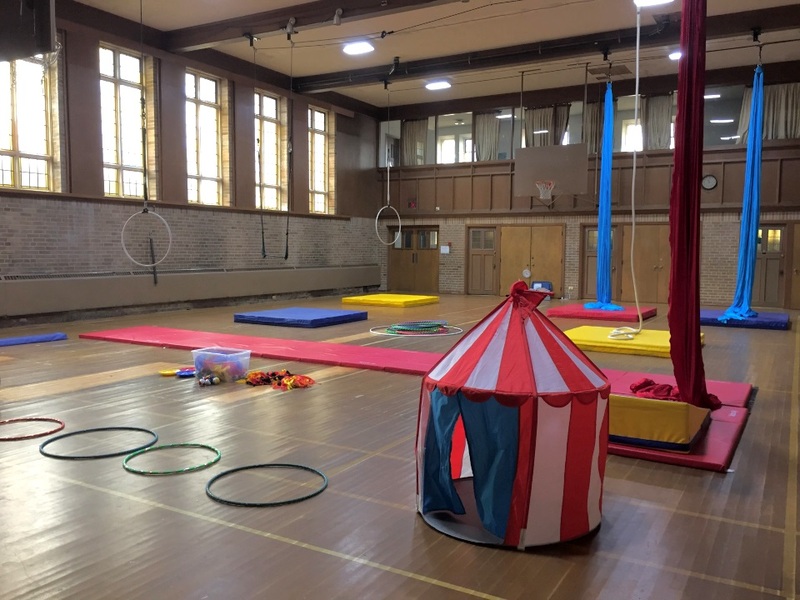 Toronto Circus Centre is a space where aspiring acrobats of all ages and skill levels can experience the magic of life under the big top. A great way to get in top shape and have fun in a non-competitive environment. With so much variety in the circus, everyone will find their place to feel like a circus star! Our founder, Jen Georgopoulos (jenflys.com), is a former competitive gymnast with a degree in Kinesiology. She has over 25 years’ experience in children’s programming and was owner and operator of a successful circus school the past 10 years. Jen is a professional circus artists who has been invited to work with the world’s top circuses. She also enjoys an exciting career as a stunt performer in film and television. Check out our Classes, Camps & Parties below. In addition, we also offer Custom workshops for your school/sporting group. Email us for details! Don't see the class day/time you need? Get in touch! We're adding new classes all the time -- yours may be next! Click on programming title to see full description, schedule, pricing & registration details. Jump, swing, twirl and tumble! Our tiniest troupe members explore aerial and ground circus acrobatics, encouraging fundamental movement skills and play. A parent/guardian and tot program. Ages 2-3. Creativity, confidence and co-ordination are at play in our Kinder Cirque class where our growing performers tackle circus feats of ground and aerial acrobatics. Ages 4-5. Experience life under the big top. There is something for every junior circus star in training in this program. Juggling, floor and partner acrobatics, aerial trapeze, hoop, rope and silks. Increase strength, flexibility, co-ordination, confidence and creativity. Enhance performance in any sport. Students invite parents to a circus show at the end of the year - an attraction not to be missed! Ages 6-11. After-School Pickup can be added as an option on the registration forms for these classes. 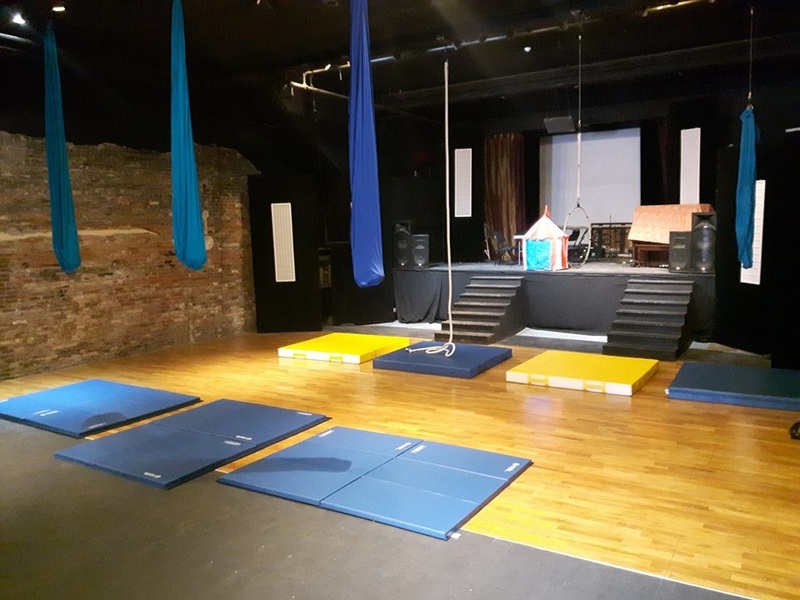 Students train on aerial trapeze, hoop, rope and silks, as well as floor and partner acrobatics and juggling, with an option to focus on one apparatus if they wish. Whether they are a beginner, cross training for a primary sport, transitioning out of competitive sport or have aspirations towards a career in the circus, this is great class to keep in shape while having fun. Students invite parents to a circus show at the end of the year - an attraction not to be missed! Ages 11-17. A more intense circus training regimen for kids and teenagers with professional circus aspirations. This twice-weekly class focuses on individual acts and full show creation. Previous circus experience & required. **Students must be enrolled in both Monday & Thursday performance classes** Ages 8-17. Have fun as you build strength, flexibility and agility through circus training! Aerial trapeze, hoop, rope and silks are used in combination with ground-based training techniques to get you up, up and away in no time. All levels welcome, this 1-hour class is especially geared towards adults with little to no circus experience. Ages 18 and up. Dramatically increase your flexibility, improve posture, relieve pain, increase range-of-motion for all sports and improve your lines for dance or aerial acrobatics. A beginner-friendly stretching class with curriculum taken from gymnastics, personal training, and Russian professional circus coaching techniques. Fly through the air with the greatest of ease! Have fun as you build strength, flexibility and agility through circus training. Aerial trapeze, hoop, rope and silks are offered, with the option to specialize if you wish. All levels welcome. Ages 18 and up. A full week of circus fun! You’ll be amazed at what children can achieve in this immersive week of circus. Aerial trapeze, hoop, rope and silks as well as juggling, floor and partner acrobatics and clowning. There’s something for every junior circus star in training! Indoor and outdoor activities (weather permitting). Students invite parents to circus show at the end of the week – an attraction not to be missed! 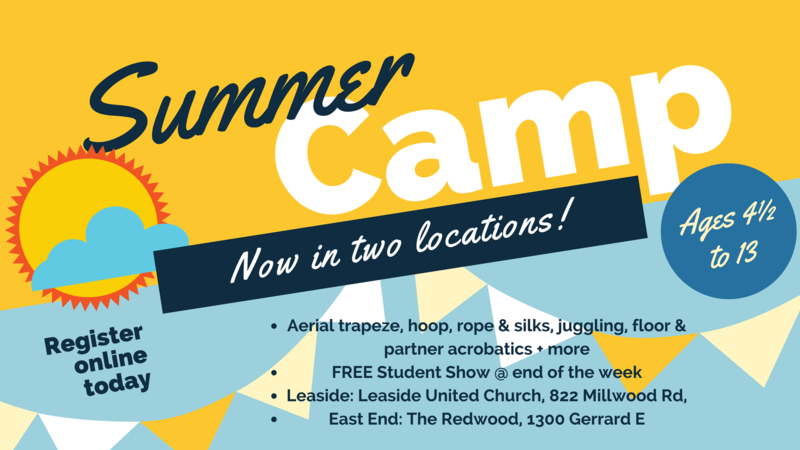 – Summer Camp 2019 dates -- Register now! What could be more fun than bringing your friends to your circus party!? Kids get to experience aerial trapeze, hoop, rope and silks as well as floor and partner acrobatics and juggling. Face painting and balloon animals for every child. Our parties are private and parents are welcome to bring in whatever nut-free food they wish. - Party timeslots at both locations are available on: Friday evenings & Saturday or Sunday daytimes. Dramatically increase your flexibility with top contortionist from the Chinese circus and Canada’s Got Talent finalist, Aygul Memet. Improve posture, relieve pain, increase range-of-motion for all sports and improve your lines for dance or aerial acrobatics. A solo- and partner-stretching class whose curriculum is taken from gymnastics, personal training, Chinese and Russian professional circus coaching techniques. – Email us if interested in this class. We are planning to make arrangements to restart it! What wonderful experiences and memories you are creating! A definite Leaside business to check out for those with kids. Great teachers that create a fun environment with a real circus experience. I am so very grateful for the spirit, confidence and happiness that finding your community has given to my son -- he simply loves coming to you and he couldn’t be prouder of himself. As a mom and a teacher, thank you for sharing your gifts of leadership, awe-inspiring athleticism and kindness. at Field Ave & McRae Drive. © 2017-2018 Toronto Circus Centre Inc.
Sign up for announcements, class specials & more!